I just realized that I had my 6th veg-anniversary. In February 2012, I planned to try a vegan diet for one month., but just kept going. Although I am not always perfect, I have remained consistent to the ethics and philosophy. I don’t want to contribute to the horror that is CAFO (factory farming) and how it affects animals, people and the earth. I vote with my money for a more compassionate world. It’s not just about what is humane, it also makes sense in a scientific, factual way based on resources, antibiotics, pollution, carbon and health. In all honesty, I wasn’t sure I would be able to stick with this. For the first year I wondered if I would just lapse, as is somewhat common. The biggest hurdle has always been the social one for me. It isn’t comfortable to go against the mainstream, and when dining with others have specific requests that are not always simple. In the last 6 years there have been big changes. It has become easier and easier to get good vegan food almost anywhere in Portland (plus, my food drawings have improved). The vegan restaurants are amazing and plentiful. I really appreciate the friends and family who have gone out of their way to make vegan-friendly options. In the last few years I have become more depressed and hopeless about climate change. It is the most important issue to me because it will impact everything, including the animals. The animals in this case keep me motivated to continue to speak up for them. My socially awkward issues are nothing compared to the torment they endure at our hands. 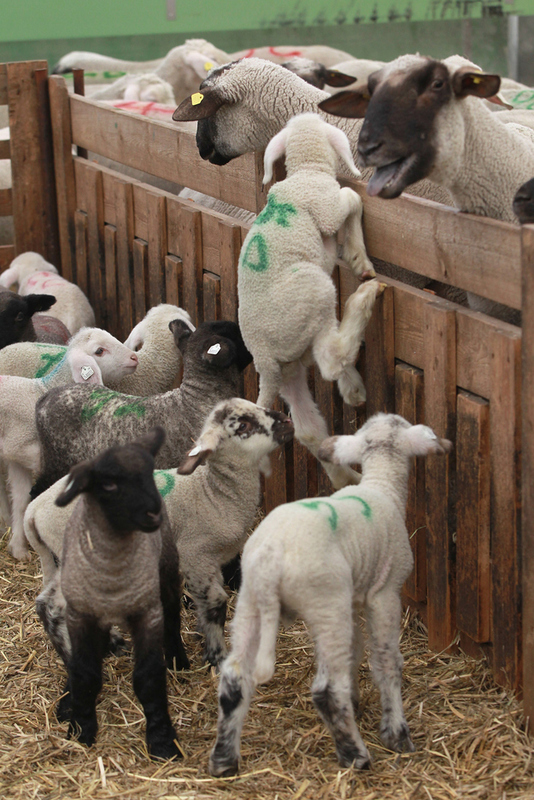 As we approach Easter and Passover, please consider that lambs are innocent baby animals taken from their mothers. And that egg production on a large scale involves killing all the male baby chicks, while crowding the egg-layers in cages. This is just the tip of the iceberg. I try to post positive images, but it’s important to acknowledge the reality, and possibly it will help others think about these animals as more than products. 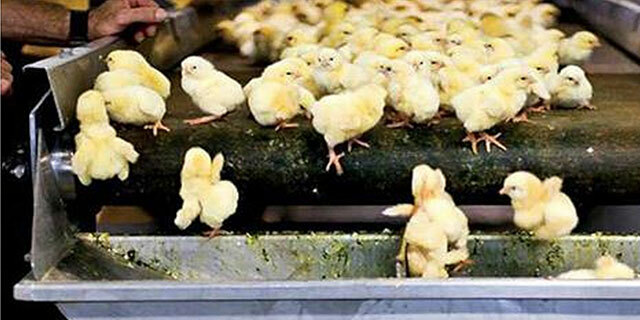 Male chicks are ground to death or suffocated since they are not needed for eggs in large-scale production. We have the worst administration to help these issues right now as they care about profit over anything and refuse to acknowledge facts about climate change (despite the rest of the world moving away from fossil fuels). Please know that even as they roll back the small amount of humane laws that existed, you still have some control. You can make sure these companies adhere to higher standards than the law mandates by affecting their bottom line. I know that no one would want the suffering that is happening, which is hidden from the consumers with advertising and lobbyists. I can’t believe I went through decades not knowing what is happening. In fact, even the humane farmers talk about “harvesting” animals to avoid the reality of slaughter. The good news is that it has never been easier to move away from animal products. There are more and more products in the market every month. There were no vegan yogurts at Fred Meyer 6 years ago, not there are 3 or 4 different brands! The alternative milks is the easiest switch to make, so many delicious choices. Socially, the more people who want a plant-based option, the easier that has become as well. I have found it helpful just to be involved in planning events and volunteering so that I can make sure that there are vegan options available for everyone. Eat less meat, eat less. This blog isn’t about weight loss, but I want to finish up the Meal Mentor program review with some personal insights I had. A lot of these were directly from the community and Lindsay herself. For those unwilling to dive into veganism or vegetarianism, one positive step they can take is to eat LESS meat, LESS dairy, LESS eggs. Those are really easy ways to reduce overall consumption and drive up the demand for plant-based alternatives for everyone. If more people could do that, it actually makes a greater impact than just a few strict vegans. If you aren’t familiar with Tobias Leenaert. He has a blog called The Vegan Strategist which is very interesting. He promotes a more strategic and pragmatic approach to creating change than just telling people “Go Vegan”. The forceful, all-or-nothing method has been tried and tested over decades, and has resulted in a steady very small percentage of people embracing this way of life. I think we all look at our own experiences and think about what motivated us. We are all so diverse, it is ridiculous to expect that one message will be appealing to all. Some people will think about changing how they view animal products because of the animals themselves, others will care about health and others may do it for environmental reasons. Ideally, all three. As people, we want to conform to the norms of society, our community, our friends. It is hard to take a different path in that effect, unless you choose to only surround yourself with vegans, the world is very much a non-vegan place. Being willing to be different in this way probably attracts a lot of non-conformists which gives vegans the “weird” stereotype a lot of people think about. Obviously, in real life there are all sorts of people who see the benefits and science of the issues our world faces if we continue down the path of consumption we are on. Some of us are not even radical, it just makes a lot of sense. Personally, when I stopped eating meat I felt much more aligned with my inner values. It is not a hardship besides some difficulties navigating social events. I would recommend everyone give it a try, just for 3-4 weeks to see how you feel. But, do it thoughtfully with a plan (this is the one I used) so that you can be healthy. Anyway, back to the weight loss part of the Meal Mentor program. I needed to lose at least 20 pounds, probably 25 to get to a healthier weight. This is not an exaggeration. I am 5 foot 7, so losing 5 pounds has literally no effect on me. I could see the weight gain in my face, bust and waist particularly. I know I eat healthy foods, so why is this happening? After showing my Meal Mentor Buddies my instagram feed, and getting input, I made some changes. I am only eating within an 8 hour window, allowing 16 hours for my body to work on it’s reserves and concentrate on repairing body functions, other than always needing to deal with digestion from incoming food. This is really easy for me. I am not hungry in the morning, so listening to my body, I eat breakfast around 9:30 or 10:30 am. Then I don’t eat after 5:30 or 6:30pm. This is a form of intermittent fasting, although far from being extreme. I have found that I am not constantly hungry any more. I am drinking more water. I am careful about, and am enjoying my meals much more. The meals feel more like “fueling my body”. As a country, we are in an obesity epidemic. I believe that this is part of the over-consumption that is happening in these periods of abundance. Fast food, processed foods and many restaurants have oversized servings and calories that far exceed what we require. My smaller portions and eating less are not dieting. They are my lifestyle, and is giving my body what it needs, just not more than it needs. In my sedentary job, I do not require massive amounts of calories. I feel more like I am treating my body better, by giving it premium food and less of it. It’s really more a form of mindful eating. Lindsay S. Nixon from Meal Mentor (and Happy Herbivore) had a great analogy of why the intermittent fasting concept works. If you have a pantry full of cans of chickpeas, and every time you eat a can of chickpeas you replace it, you will never create a deficit. My pantry is pretty overflowing with chickpeas, so I am chipping away at it, letting those run out by giving space in the evening where I am not restocking constantly. I am not sure I explained that perfectly, but it is working for me. You can read about her background and research here. I’m going to go back to non-diet blog posts for the most part. This actually does tie into my whole concept of Eat 4 the Future in that there are environmental benefits of simply reducing how much food we buy and eat to reduce food waste. Lightening your carbon footprint literally. Let me know your thoughts and experience, or any questions. As I posted earlier this year, I signed up for Meal Mentor to help with meal planning, healthier meals and weight loss. 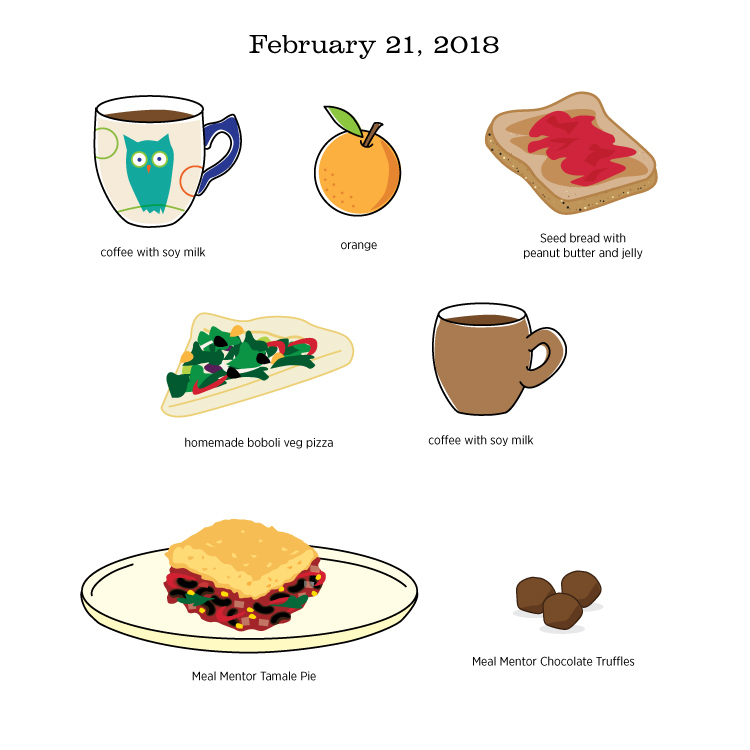 After consistently using it for dinners (and mostly eating the leftovers for lunches) since January 1st, I can write a review about my experience. At first, I wasn’t sure this was going to work for us. I am glad I gave it a chance and kept trying it. The meals are so healthy, it was a bit of an adjustment for me to stop using oil and processed food. The kids are picky and won’t always eat what I make- but that happens anyway unless we have pizza and enchiladas all the time, so I don’t factor their preferences in completely. Variety of recipes: Every week there is a new set of meals emailed over. The items are very creative and keep everything interesting. There is flexibility in deciding what meal works best each evening since I already have all the ingredients for the week. Healthy meals: I would describe these meals as “relentlessly healthy”. Instead of sautéing in oil, broth or water is recommended. I’m almost to my 6th year veganniversary, and while my reasons have never been about diet, I needed to be much more thoughtful about my food choices. I know if I am following the Meal Plan, that these have had nutritional oversight and are balanced and low calorie. They can be made gluten free and soy free. Shopping lists: The list is super well organized and makes it easy to hand off to Jonathan my personal shopper. The ingredients are inexpensive, whole food, plant-based and easy to find. No pomegranate balsamic vinegars. These are simple items like lentils, rice, vegetables, hummus, salsa, beans and spices, etc. Support group: Their is a special Facebook community for annual members that is wonderful. Lindsay S. Nixon (the founder/creator) pops in personally and answers questions. We post photos (or illustrations) of our meals, share tips, success stories and help keep each other motivated. I have not seen any snark, judgment or negativity that is common online. I feel like I have a new group of friends. I have not used the meal prepping concept yet, but it is set up so that you can batch prep or cook the meals in advance. Eating healthy food, all made from scratch seems time-consuming. This has helped me enormously. My taste buds have really adapted to loving these recipes, and I actually don’t want to stray away from them. The recipes list the amount of time each one is to make, so I can decide if I want to take 5 minutes or 20. Personally, I had a weight loss goal with this. I had a slow start to this, and have only lost 5 pounds so far, which is not anything exceptional. However, I had a breakthrough recently thanks to Lindsay and this group and it feels as if things are going to be a lot easier for me now. 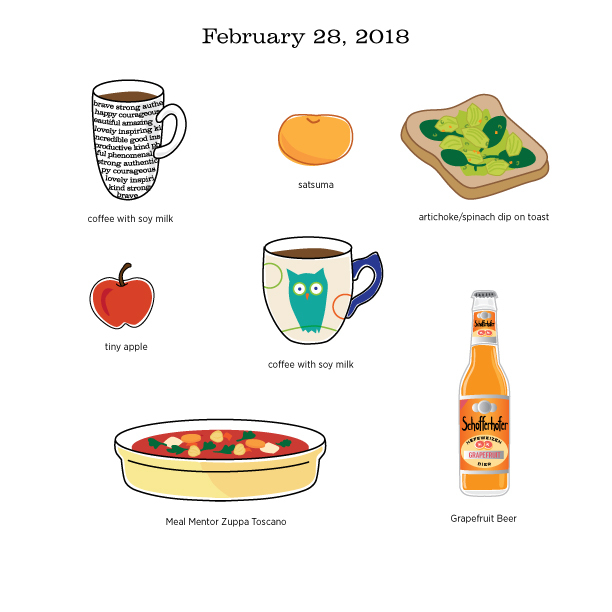 I’ve been tracking what I eat by drawing it (I also enjoy doing food illustrations). You can see a lot of the Meal Mentor plan recipes on my instagram feed. 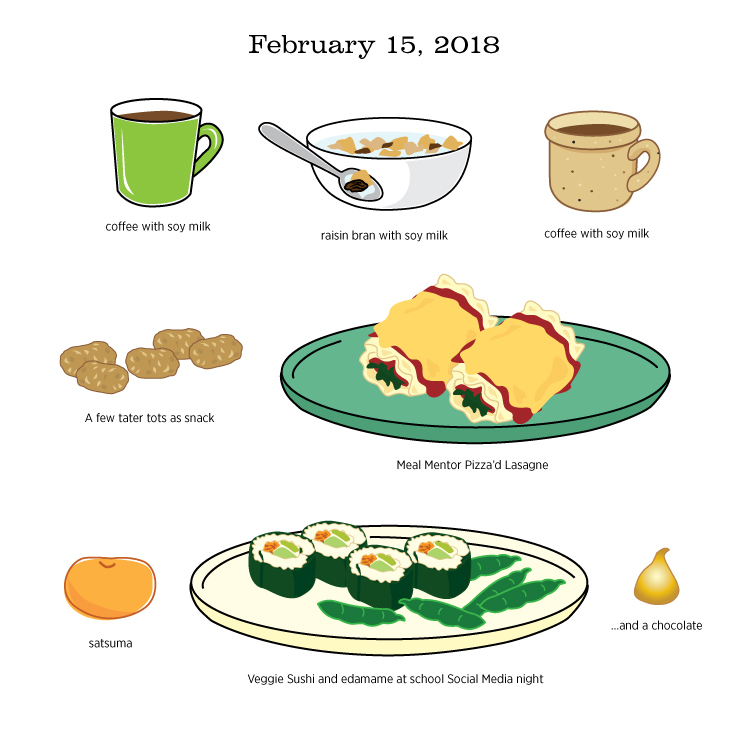 I made it a goal to post every single day in February. If you want to give it a try, there is one free sample week available on the website, and you can get a glimpse of the menu items for each week. Let me know if you join!